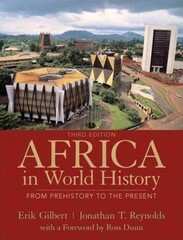 Africa in World History 3 Edition Provides a view of African history in the wider context of world history. Africa in World History is the first comprehensive survey to illustrate how Africans have influenced regions beyond their continent’s borders, how they have been influenced from the outside and how internal African developments can be compared to those elsewhere in the world. By identifying and presenting key debates within the field of African history, this volume encourages students to confront the many oversimplified myths regarding Africa and its people. Note: MySearchLab does not come automatically packaged with this text. To purchase MySearchLab at no extra charge, please visit www.MySearchLab.com or use ISBN: 9780205098491.